Vitale sees Red and other tales of terror... CPS cuts teachers and other strikers off major email and other communications places... More proof that CPS is trying to bust not only the union, but the public schools? One of the jokes at Substance is that anyone in the growing CPS Office of Communications who provides any information to Substance — even in response to a Freedom of Information Act (FOIA) request — loses a finger for each violation. It's very primitive at City Hall and CPS under the Reign of Rahm. The most dramatic and silly example on September 11, the second day of the strike, was when David Vitale, the Board of Education's multi-millionaire President, went nuts on TV (Fox News) about ALL THOSE PEOPLE WEARING RED AND GOING TO HAVE FUN! We are excluded now from most of Vitale's media events, at least if those $100,000 Propaganda Hacks in Becky Carroll's office can figure out how to do it, so we missed the live iteration of that one. 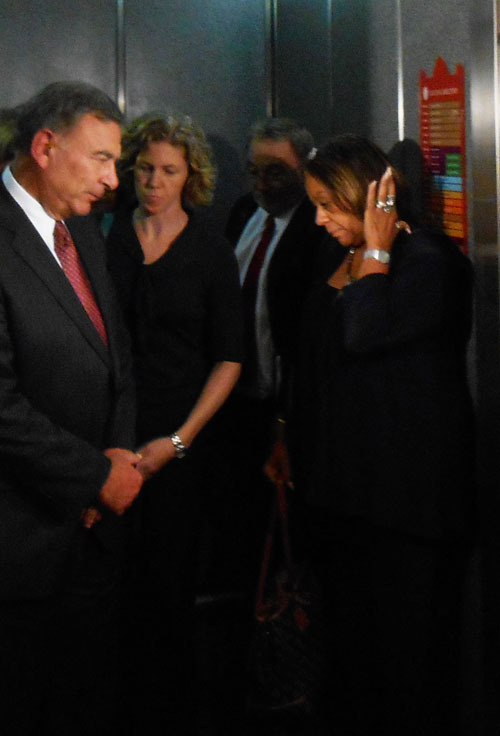 Chicago Board of Education President David Vitale (above left) tried to hunker in the elevator at the Merchandise Mart on September 7 when the Board's latest version of a "negotiating team" left the offices of the Chicago Teachers Union. Virtually everyone in the photograph above was new to the "table" where the bargaining was taking place, as CTU officials have pointed out. Above, left to right are: David Vitale (Board President, who arrived at bargaining in September 2012 and seems to be the substitute for the quarter million dollar "Chief Executive Officer" Jean-Claude Brizard); Beth Swanson, the English major who served for a time as CPS budget chieftain before going to work for the Pritzker family and then for Rahm Emanuel (Swanson, like Vitale, arrived at bargaining in September); Joe Moriarity, who took over from retired CPS attorney Patrick Rocks and retired CPS labor chieftain Rachel Resnick, both of whom got off the CPS ship in June 2012); and Barbara Byrd-Bennett, the most recent of the revolving door of CPS officials (she was hired in March as a consultant and in June was made the latest "Chief Education Officer" at CPS; prior to that she was working in Detroit to undermine the public schools there). Substance photo by George N. Schmidt.Meanwhile, the illegalities pile up. By the second day of the strike, CPS officials had cut off every striker (and lots of others, too) from the Board of Education's email system (FIRST CLASS) and many other cyber places. This included People Soft, the expensive outsourcing place for payroll information. All of that is probably illegal. Every teacher worked through September 7. The strike began September 10. The next paycheck won't come out for two weeks — unless CPS has already decided to steal that like they stole the four percent raise in June 2011. Insult upon insult only works to strengthen my resolve. Not one of those people can hold their head up with pride. They can't even look at each other.